Charlie was found in the trash outside the Cobbs Creek Recreation Center on Tuesday, October 24, 2017. The community and animal lovers across the city have rallied behind him. 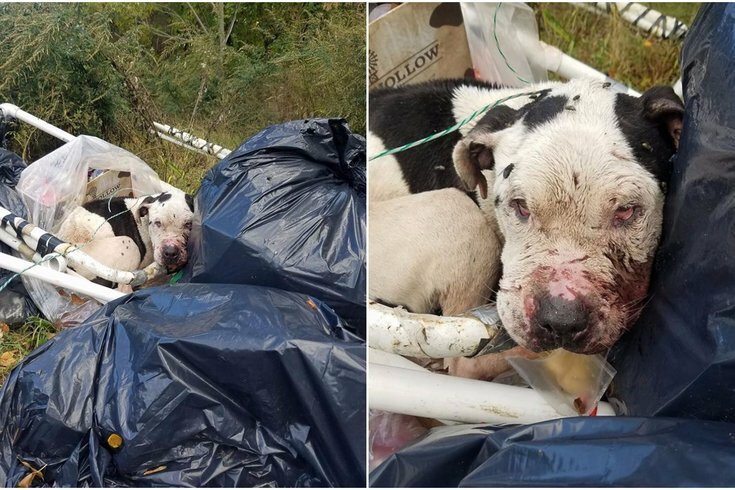 This is a story about a horrible case of animal abuse – and an uplifting example of a community rallying together to save a helpless victim. Around 4:15 p.m. Tuesday, Nikki Rubino and roommate Rob Rossi made their way to the Cobbs Creek Recreation Center. Rubino had been tagged in a Facebook post about a dog found in the trash at a Dumpster outside the South 63rd Street facility. That the 2-year-old pit bull mix showed signs of life was good. That he wouldn’t move from the garbage bags on which he laid was not. “I had to crawl onto the trash pile to get close to him and pet his head,” Rubino said. “He was covered in flies and filth. As soon as I gained his trust, I untied him and he surprisingly wobbled over to my car and crawled into the front seat. Safe, the dog that folks in Cobbs Creek and beyond are calling “Charlie” was. Not only did the pair of rescuers get Charlie to Philadelphia Animal Hospital within 45 minutes, but he’s been receiving treatment there since. The discovery prompted an outpouring of donations through the “West Willy” Facebook group and a YouCaring page. Within two hours, more than $700 was raised and the number is still rising. It also sparked an investigation through the Pennsylvania Society for Prevention of Cruelty to Animals’ humane law-enforcement unit. Charlie, who was found in the trash outside the Cobbs Creek Recreation Center on Tuesday October 24, 2017, was driven to Philadelphia Animal Hospital for treatment. Charlie left an indelible mark on those who rallied to his defense. Charlie’s condition was such that transferring him from the hospital to the PSPCA was of such concern that he’d stay put overnight Wednesday into Thursday. Nicole Wilson, director of the PSPCA’s humane law enforcement team, understood the need for that continued care. “She said that it would be OK to leave him there as long as they could take forensic photos to start the cruelty case charges,” Rubino said. When the Philadelphia Animal Hospital posts images of an abused animal with the description “this following photo is hard to look at, but is very important,” it’s natural for people to want to help. Though people donated money to help Charlie in the day-and-a-half since his discovery, the hospital won’t accept it directly. They’re taking care of him for free with donations going to City of Elderly Love: Save a Senior Pet instead. Charlie receives treatment at Philadelphia Animal Hospital. Now, the search is on for whomever left a dog for dead near Cobbs Creek Rec. Instantly, there were promising leads. 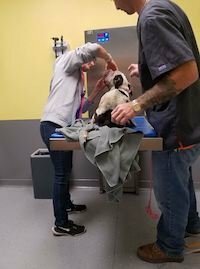 “While he was not adopted from the PSPCA, it appears that he did have a microchip implanted here as part of our front clinic/vaccine clinic services,” said PSPCA’s director of public relations Gillian Kocher. That wrinkle might help catch the people responsible for this near tragedy, which appears to indicate Charlie was used as a bait dog for fighting purposes. 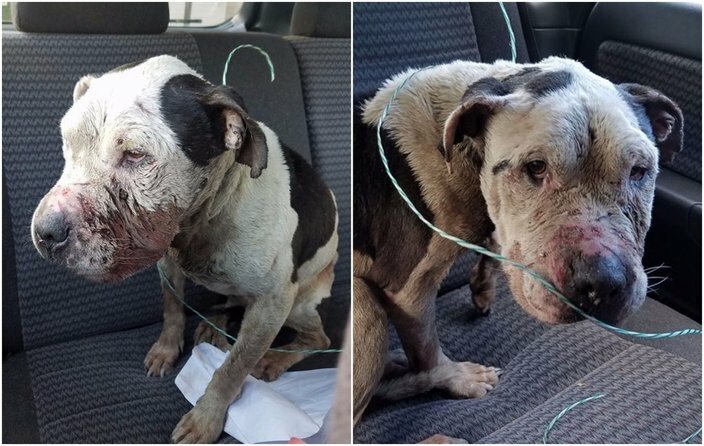 “Our officers will be investigating to find out more as to what happened, how he ended up in this condition, who his owners are and if charges will be in order,” Kocher said. "We have good leads and are following up in those leads." For her part, Rubino plans to visit Charlie after work Thursday. “It’s amazing to see two organizations working together on different ends of animal abuse all in Charlie’s best interest,” she said. “I’ve never had so many things fall into place like this, especially for a stray dog.